A few days ago, Russian freelance designer, Anton Kudin, created a new “fold to unlock” concept for the iPhone. Needless to say, his concept turned out to be a pretty big hit. Unsurprisingly, given the history of the jailbreak community’s fast turnaround time, Kudin’s concept has been turned into a reality. This afternoon I had the privilege to sit down and test out an unreleased version of Unfold, a new jailbreak tweak from German jailbreak developer Jonas Gessner. Unfold, as you might have guessed, is a usable implementation of the fold to unlock concept. 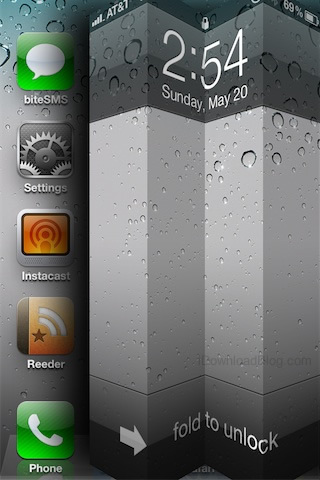 "Upcoming jailbreak tweak allows you to fold your Lock screen to unlock your iPhone" is an article by iDownloadBlog.com.